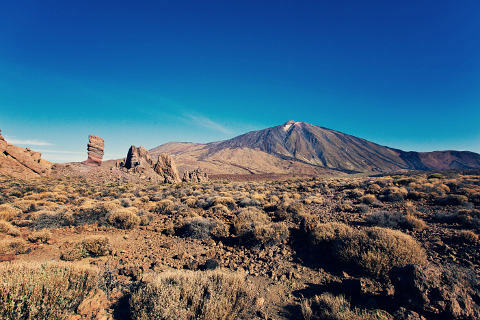 Teide National Park is a stunning national park surrounding Mount Teide in the centre of Tenerife. 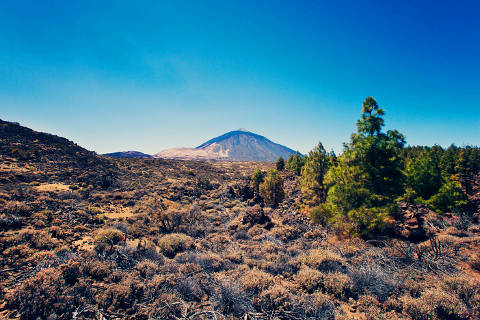 Mount Teide in the park is an active volcano though it hasn't errupted since 1909. Teide National Park is a UNESCO World Heritage Site and is the most visited national park in Europe. Mount Teide is a volcano within a volcano. Millions of years ago a volcano exploded and left behind a 16km-wide crater and, on its northern edge, a smaller volcano - Mount Teide. The whole area is now a weird volcanic landscape filled with lava rocks, lava streams and ash beds. Teide National Park is very beautiful as well as being very unusual and should be at the top of everyones to-do list when visiting Tenerife. The crater is edged by a craggy rim known as La Caldera de las Canadas. These rocks have been erroded into very interesting rocky structures. Even more weirdly shaped are the lava rocks called the Roques de Garcia. One of these, the Cinchado, appears in many photos of the park. The Cinchado is more erroded at the base than the top giving the impression that this huge rock will topple at any moment. The view of the Cinchado with Mount Teide behind it is one of the highlights of the park. As well as some wonderful rock formations the Teide National Park is home to the wonderful tall Echium wildprettii also known as Teide viper's bugloss. These amazing plants have 2m tall reddish spikes in early summer. 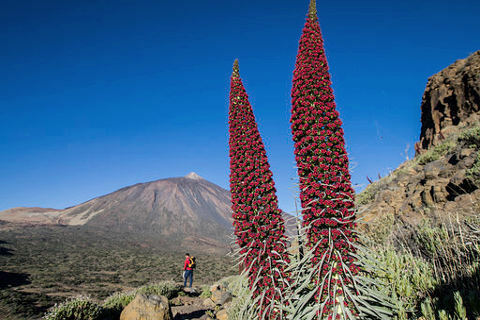 May/June is the best time of the year to see many of Teide's plants in flower. A single road crosses the crater, known as Las Canadas and this leads to a Parador and a cable car. The cable car takes you close to the summit of Mount Teide and offers great views of the surrounding park. A forty minute fairly strenuous hike takes you from the cable car to the crater. If you want to hike to the top you have to apply beforehand for a licence which is valid for one day only. Visit the Reservas de Parques Nacionales website for a licence. The licence is free but we recommend that you reserve in good time as numbers are limited. The summit of Mount Teide is at 3718 metres making it the tallest mountain in Spain. 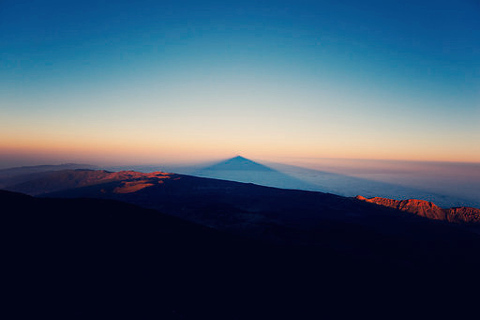 Mount Teide is also the third tallest volcano in the world. There are two visitor centres in the park with lots of information about how the dramatic landscape came about and there is a restaurant and bar. There is also an observatory, the Observatorio del Teide, on the east side of the park. If you want to really have the chance to explore the surreal landscape then a stay at the Parador de Canadas del Teide is not to be missed. It is set right in the park very close to the Roques de Garcia. If you want to stay in the park but pay a bit less then the Altavista refuge at an altitude of over 3000 meters could be what you are looking for. 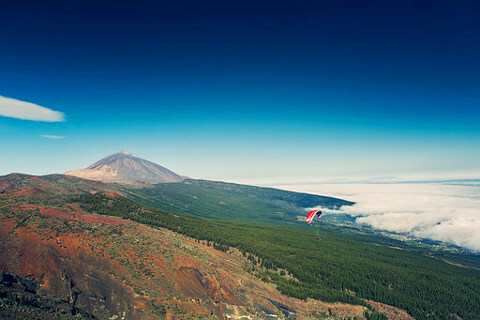 Teide National Park was voted one of the twelve wonders of Spain in a national TV and radio competition in 2007. It is the most visited national park in Spain and Europe and the 8th most visited in the world. If you are visiting Tenerife without a car there are buses from Costa Adeje and Puerto de la Cruz. 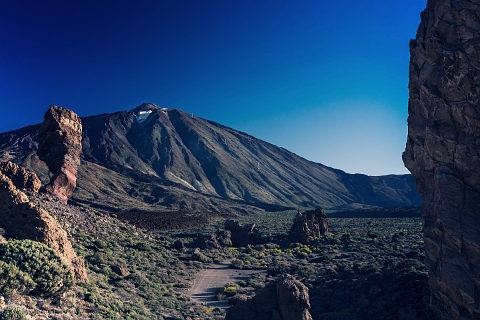 Weather conditions in Teide National Park are more extreme than for the rest of the island and in winter snow falls on the peak of Mount Teide and in summer temperatures can reach 40°C and more. 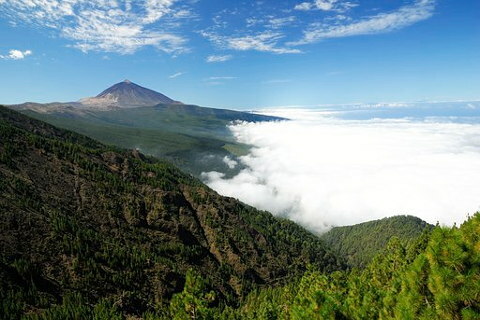 As Park Teide is at the centre of the island it is a similar distance to most of the coastal towns. If you are enjoying the natural landscape of Tenerife you will no doubtt also enjoy a visit to Masca and the Teno mountains. Photos kindly supplied by Turismo de Tenerife.